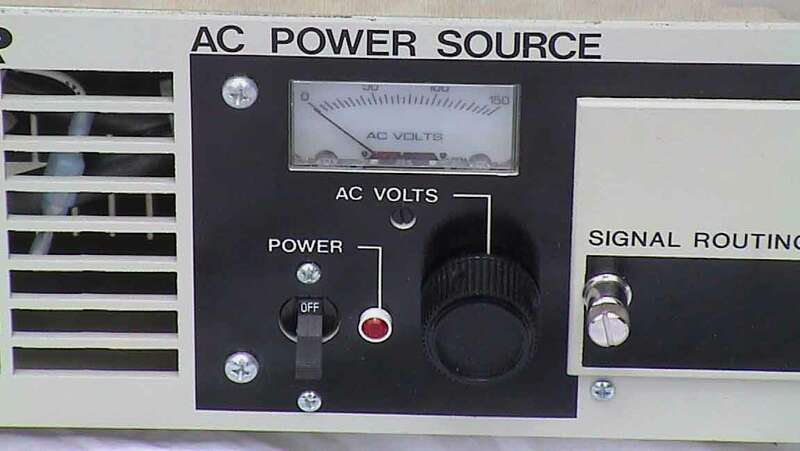 The 251B is a portable, 250 Watt, wide band, programmable AC source. It is in excellent physical and electrical condition. The B series provide a wide range of single, two and three phase, precision solid-state AC power sources. Designed to provide variable voltage and frequency for testing linear loads over their full voltage and frequency ranges. Voltage: Standard inputs include 115VAC, 208VAC and 230VAC, 1 Ø. Consult us for how to specify. SL & B Series sources require either a manual or Plug-in-programmer oscillator. These oscillators determine programmability of output voltage, frequency, phase, etc. Voltage Range: Full rated VA from 55-65 VAC, 110-130 VAC, or 220-260 VAC over a ± 10% input variance and rated load PF of 0.7 to unity. Output Frequency Range: 45 Hz to 5000 Hz at full rated power. Load Regulation: ± 1% no load to full load over full frequency range; ± 0.015% when equipped with external sensing. Line Regulation: ± 0.25% at rated load for a ± 10% input variance. Operating Temperature Range: 0 - 55 ° C.